Two things riled us up over the weekend: the Visit Malaysia Year logo for 2020 and the so-called interrogation of Dr Siti Hasmah Ali, the wife of the former Prime Minister Mahathir Mohamad, over some things she said during an anti-government rally last year. Malaysians made fun of the logo, the orang utans in the logo, the penyu and its Oakley (or Ray-ban). They slammed Nazri the Minister, they even "weep for all our great graphic designers". I think some of them over-reacted, big time. The logo's kinda cute, if you ask me. And it might have actually been designed by some school kid or some talented OKU, if you know what I mean. My only complaint is the use of the Twin Towers (is it Mallaysia or Malalysia?). Why not The Exchange 106 (which will be 40 m taller than the Twin Towers when completed in a few months)? The picture that went viral of the "interrogation" is so damning. Tun Siti could be nodding off or looking at an odd stain on the desk but from this angle it does look like she is at the point of breaking down. 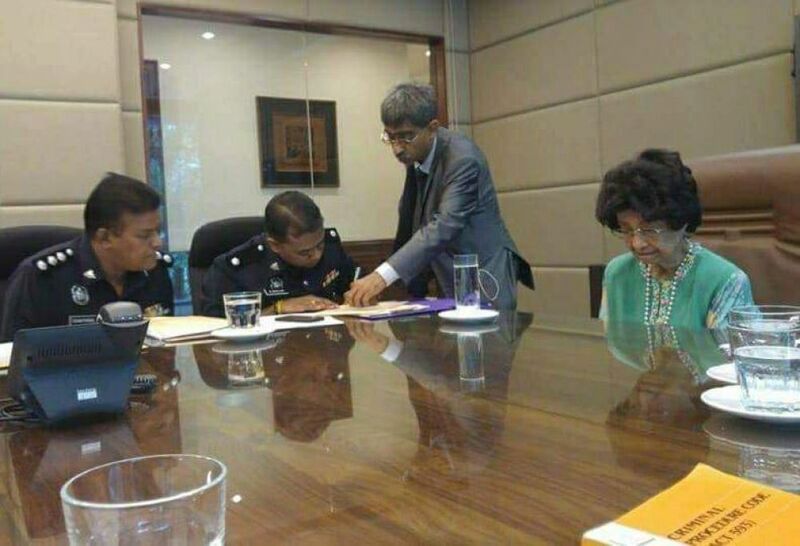 If you were not touched by the photograph, Rafidah Aziz's Country has reached new low by investigating Dr Siti Hasmah and Siti Hasmah wasn't even involved in kleptocracy make sure you are fired up! But Siti Hasmah was not called to the police station. The police station came to her. In fact, the policemen were sheepish, embarrassed (in other words, respectful and just doing their job), we found out later. Not just that, Tun Siti was not intimidated or afraid (her words, not mine). Like most Malaysians my generation, I'd grown fond of Tun Siti, who stood quietly and solidly for 22 years behind the country's longest-serving Prime Minister. Throughout her First Ladyship, she was witty, comel and, like the wife of the current Prime Minister, can really sing (and play the piano, too). In the early years of her First Ladyship, the nasty people accused her of demanding a percentage of whatever business you wanted to lobby from her husband. One of her kids complained to a New Straits Times editor about a journalist who failed to get to her feet when the mother entered the room; the journalist was quickly transferred out of Jalan Riong. Other than these, Siti Hasmah managed to stay away and above all the scandals and crises that plagued her husband and children. If she were my mom, I'll whack them for exploiting her for their own gains. I am sure you have seen me and her in my facebook albums... that speak volumes... Cheers bro Bru.. The twin towers in the logo is to mock Che Det. The fading tower means that the old twin towers is slipping into history. The clearer tower standing in front of the word Malaysia is to symbolize the TRX 106 under construction. Easy. Hidup Che Det! The real Gajah in the bilek is why Najib & Rosmah have not been questioned!!! Who stole the billions & how? Of course it is not necessary if everybody knows the answer to that questions. Perhaps you will be questioned on your silent support for Najib after the next election. The bigger elephant in the room is, why she cannot be questioned?? Witness need to be questioned too not only suspected criminals! !